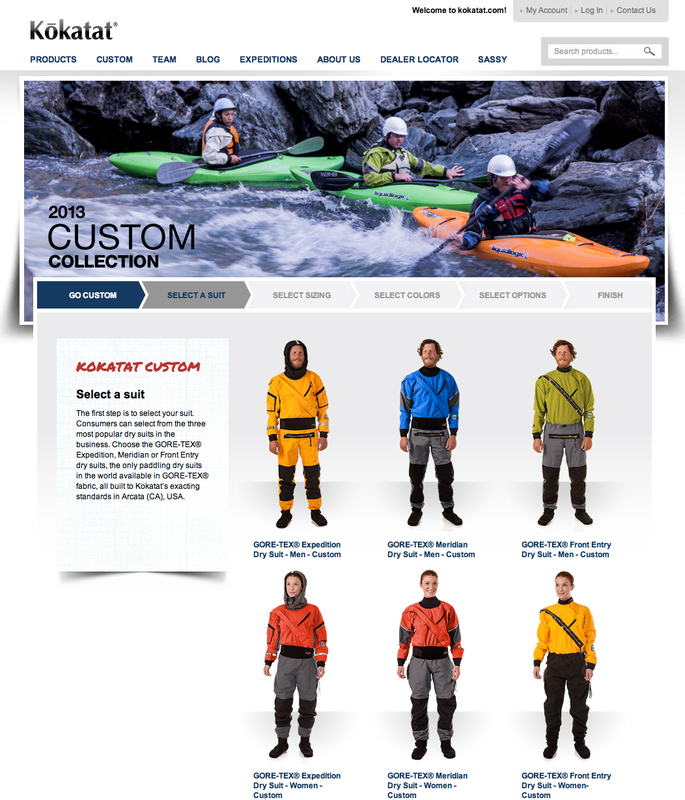 Kokatat is offering paddlers the opportunity to create and purchase their very own custom GORE-TEX® dry suits with the launch of a new online tool. Affectionately referred to as GIZMO, the online tool lets customers easily design and personalize their own custom, made-to-order GORE-TEX® dry suit. Each customized GORE-TEX® dry suit will be individually constructed in Kokatat’s Arcata, California facility to the consumer’s specifications of colors, features and sizing. Once an order is placed through a Kokatat retailer the custom suit, made to Kokatat’s exacting standards, will be ready for shipment in three to four weeks. “For a long time we’ve offered custom dry suits, but with GIZMO we’re putting the design right into the hands of paddlers around the world,” added Turner. Kokatat is offering customization of three of the most popular dry suits in the industry: its GORE-TEX® Expedition, Meridian and Front Entry dry suits. Once the suit model is selected, visitors are taken through a detailed step-by-step measuring process to ensure proper sizing with the ability to lengthen or shorten as required. The final step of the program lets customers mix and match from over a dozen different colors and add custom features including pockets, hoods and reflective tape to complete their one-of-a-kind dry suit. To complete a design customers must create a Kokatat.com account so designs can be saved for future review or to order from an authorized Kokatat retailer. Once a design is completed and saved, an email is sent to the customer with a unique reference number and a copy of all the design details. Armed with the finalized custom design customers can contact their local Kokatat retailer to process the order. While primarily targeted to consumers looking for a one-of-a-kind dry suit, the simple measurement application will also be useful for Kokatat dealers to quickly identify the best size for their in-store customers.